Boone Central Board of Education held a special meeting in Albion Wednesday night, April 20, to accept the resignation of board member Roger Rozeboom. Rozeboom had started his four-year term in January, 2011. In addition to accepting the regsignation, the board voted to fill the vacancy by application. 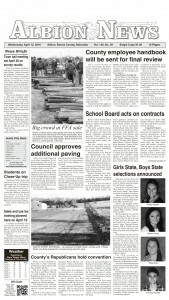 Applications to fill the school board seat will be accepted from Boone Central residents until May 13, 2011. If necessary, this deadline may be extended. Application forms are available from Superintendent Worrell at the school.